I feel like talking about zombies. Why? Zombies are everywhere. No, don’t go grab a shotgun to practice your headshot, I don’t mean like that—I mean they’re everywhere in the media. Books, movies, comics, TV shows. The undead are popping out of their graves in all our creative outlets. The idea of the zombie originated in Haitian Voodoo from the word “zombi,” meaning “spirit of the dead.” In Haitian folklore, the dead can be revived by a bokor, or sorcerer. Fast forward to modern Western culture, and you get a book called The Magic Island by W.B. Seabrook (1929), about an encounter in Haiti to these creatures. This book essentially introduced the United States to the word zombie. America was pretty into the idea of undead hordes to supplement our growing interest in mummies, werewolves, and vampires, so we started to get movies like White Zombie (which inspired the heavy metal band of the same name) and I Walked with a Zombie. 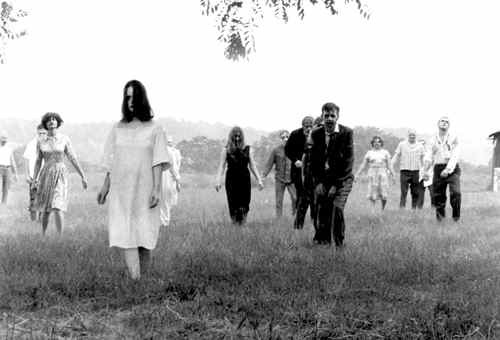 Of course, the most famous zombie movie of the 20th Century is arguably Night of the Living Dead, featuring those slow, lumbering black-and-white zombies George A. Romero made so famous as the classic image of the undead. For a while, these zombies were quite terrifying enough for us, until we decided that we wanted fast-running, raging, blood-spewing monsters to satisfy our lust for horror. Enter the New Zombie. In our increasingly-intellectualized culture, it also wasn’t enough for magic and voodoo to be solely responsible for reviving the dead. Desire for a scientific explanation gave us the virus zombie, which may have first appeared in Richard Matheson’s I Am Legend, though it’s often thought of more as a vampire story, and more recently in the movie 28 Days Later. Here we see zombies that are not, actually, the undead, but rather the result of a virus gone bad. We also get the New Zombie, which is fast and agile. Sure, it’s good fun to watch zombies run amok—eating brains, chasing our protagonists, taking over the post-apocalyptic world—but in well-made zombie stories, there’s often social commentary on our modern society. It might be serious, like 28 Days Later’s look at how chaos and violence thrive in a society without rules or authority, or it can be hilarious, like in zombie parodies. Shaun of the Dead brings us to the zombie horror-comedy, a genre which arrived with cult classics like The Evil Dead. But rather than just giving us some utterly revolting visuals of people in a cabin becoming the very disgusting undead, we get the amusing, but also thought-provoking, idea that, in a world where people go about their mundane lives on autopilot, we may as well be zombies already. Also, we get Simon Pegg wielding a cricket bat and a zombie-beating Queen montage. The zombie horror-comedy seems to have become the new trend. We’ve got tongue-in-cheek zombie books like World War Z and hilarious movies like Zombieland (the rules for surviving the zombie apocalypse, a gun-toting Woody Harrelson, and a desperate quest for the last Twinkies in existence? I’d call that a win). Even getting rid of the slow, lumbering zombies of the Romero era and utilizing the quick, dangerous New Zombie apparently still wasn’t scary enough, so we decided to ditch the scare-factor almost entirely in favor of a more humorous approach to those zany undead. But, in ditching our old versions of zombies, I fear we might forget the point of the horror in those earlier books and movies. A friend of mine pointed out that he dislikes zombies who run fast because there’s something much more sinister about the slow zombies the likes of which you find in Night of the Living Dead. What people tend to want now is gore, action, violence—and they forget the original point of zombie horror. Imagine everyone you loved has become a mindless cannibal, the world a desolate and lonely place. You are alone, or left with a motley band of surviving comrades. There is an innate sense of hopelessness in this that we don’t get from Zombieland, however gut-bustingly badass that movie may be. Some of this slow realization about the nature of life and death is lost when zombies are sprinting after you like a pack of Jamaican gold-medalists. Am I saying that the earlier vision of the zombie trumps the newer? Not at all. In fact, all of the movies I listed in the second half of this post are some of my favorites of all time. But there is certainly a connection between the direction our culture is moving in and the way zombies are depicted. What’s great is that zombies can serve many purposes. They can give us that hopeless horror from Night of the Living Dead, they can comment on science and government as in 28 Days Later, and they can also make fun of the way society works in zombie parodies. Zombies are a surprisingly versatile genre. And maybe that’s why we love them so much. Very entertaining! And spot-on observations on society, culture and zombies. Love the picure of the zombies running next to the professional runner. How did I forget to mention Bill Murray? That part was fantastic! Thanks for mentioning that. The runner I juxtaposed the zombies with is Usain Bolt. Exactly! Even if you don’t like horror movies, there’s a zombie film out there for you somewhere. And zombies on the whole are just an interesting concept, considering they’ve been used in so many different ways. It’s the slow moving horde that I’m drawn to. As you noted they depict society in such a way that is chilling. Romero was spot on about the shopping mall. Oh yes, the shopping mall was a perfect location to choose. Romero had some good insights to share about society. i.love.zombies. personally, i would prefer the old school sort if it weren’t for the fact that 28 days later sports the far-too-yummy cillian murphy. i’ll watch that man sprint for his life any day of the week. What I think is so interesting about Zombie culture is how everyone knows what role they would play in a zombie apocalypse. People have thought about it in relation to their lives enough that it actually seems relevant to have a game plan. Personally, I would crack. But maybe that is one of the pleasures of horror–contemplating the extent of what you could do or handle. Combat has strayed from our lives, you don’t have to physically fight for anything these days. So I think people feel a twinge of primal pleasure when they image having to fight for their life. Did you know there are actually zombie survivalist groups out there? Basically they learn survival tools and plan for zombies. It’s very interesting. There are a lot of pleasures of horror. One is that I can think quite cheerily about the zombie apocalypse, but I doubt I’d be one of the survivors in real life–and even if I was, it would be horrible. That’s a good point about the primal pleasure, and I think that definitely plays into it. There are very few primal pleasures in our 21st century, technology-driven world.